Families, language, fear, loss, food and the victories that can come slowly. These are at the heart of this collection of poems by 46 people who have come to New Zealand as migrants or refugees. More of Us provides a glimpse into the experiences of this diverse group of people, which includes those who made New Zealand their home decades ago, and newcomers still finding their feet. Some are well-established poets, and some are high school ESOL students. And here they all are, speaking in their own distinctive voices. 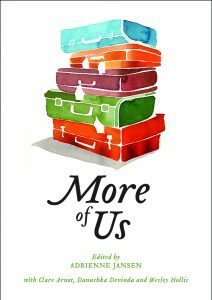 More of Us is a companion book to All of Us, a collection of poems by Adrienne Jansen and Carina Gallegos, published by Landing Press in 2018. Available from March 2019 from Landing Press and good New Zealand bookstores. Landing Press is a small cooperative press based in Wellington. It focusses mainly, but not entirely, on poetry.